At first glance, a nasal helm like this Norman Nasal Helmet might appear to be quite similar to a spangenhelm, but the two are actually quite different, with the primary differences coming from the differences in the two helms style of construction. You see, a nasal helmet typically featured a solid skull cap, forged from one piece of metal, while a spangenhelm typically consisted of several plates that were riveted and forged together. This helmet, as its name suggests, is a typical nasal helmet at its finest, featuring a solid skull cap that is adorned with a brow band that possesses a simple wave decoration. The band also serves to enhance the helmets level of protection. The classic nasal guard is also present, complete with a central ridge down its lower half to help increase its strength. 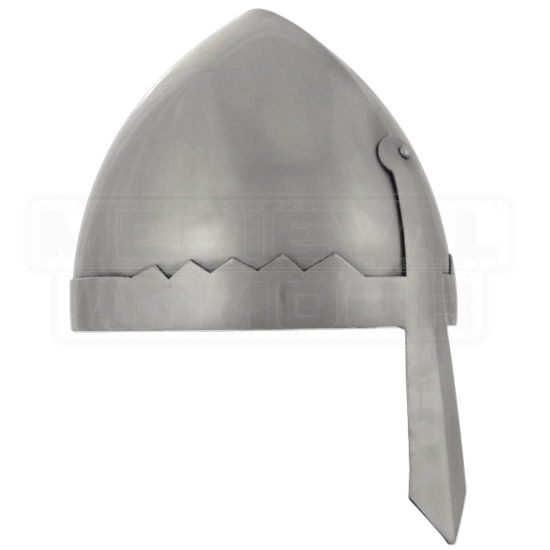 The helmet is fabricated from 16 gauge steel, which provides even more durability and strength, especially when you are looking for a helmet that provides not just a classic medieval look but also a high degree of defense in battle. The interior of the helmet is fitted with a suspension leather lining, as well as a chin strap, which helps to keep the helmet secure when worn. 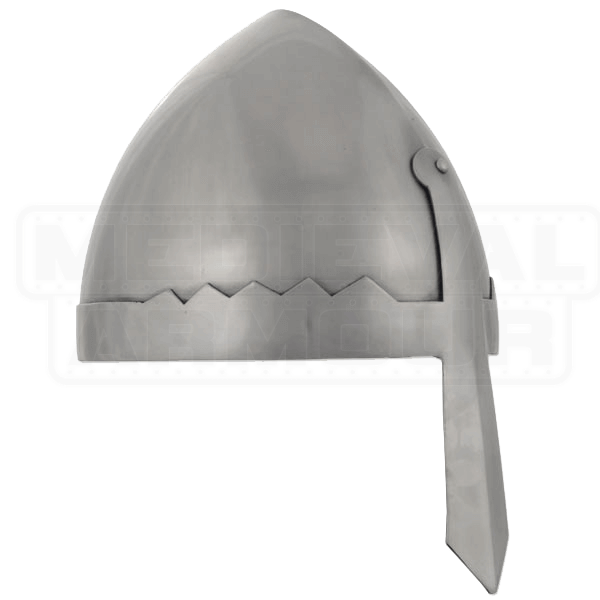 Paired with classic chainmail and a few other choice additions, this Norman Nasal Helmet will help to recreate the typical look of a true medieval warrior at their finest, while also keeping said warriors head safe from the occasional hard knock.